With the exception of reigning Premiership champions Celtic, Scottish football has relatively low expectations when it comes to competing in European competition. 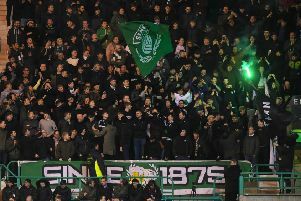 Last Thursday at Easter Road against Asteras Tripolis, Hibs looked set to continue that unfortunate trend of bowing out of continental competition before the real action gets under way. Trailing by two goals to Georgios Kyriakopoulous’ ruthless brace at half-time in the Europa League second qualifying round first leg, hopes and dreams among the Hibs faithful of an extended Europa League run quickly diminished. But what started as torturous night ended with jubilation as Flo Kamberi notched a injury-time strike that means Hibs take a narrow 3-2 lead to Greece for tomorrow’s second leg. Stern half-time words from Hibs’ coaching staff had the desired effect as Efe Ambrose set the ball rolling before David Gray had the stadium rocking with the equaliser. Forward Martin Boyle knows the remarkable recovery in the enthralling victory was the equivalent of the team being taken off a Europa League life-support machine. Ahead of the return leg, the former Dundee and Montrose player insists they are desperate not to give themselves another mountain to climb. “We’ve given ourselves a lifeline, absolutely,” said the 25-year-old. “We don’t want all our hard work from last year to go to waste by going out early. “We really want to give this a try, we know it’s a tough ask to win over here. They will make it tough and they want to win as much as us. “We knew ourselves the first half wasn’t good enough last week; we were huffing and huffing and went two goals down – and we needed that kick up the back side at half-time. “We stood off them and they scored two goals and we could maybe have avoided that. “But we eventually came into our own and we could have scored much more than the three goals. “We now need to build on that, the vital thing is not to give away any more cheap goals. “I’m sure this squad will get better, but we need to concentrate on this game. Hibs will encounter searing 30-degree heat and a Tripolis side determined to bounce back from their late collapse. After being guilty of naivety in the first leg, Boyle admits they need to be streetwise in Greece. “I’ve not played abroad a lot, it will be very hot and the weather conditions will come into it,” said Boyle. “We’ll have a few days to train and adapt to it and hopefully we play our normal game and have no worries. “Europe requires a need to set the tempo and keep the ball. “In the first half of the first-leg at home, we weren’t as patient as we could have been. “We were also sloppy with the ball, but in the second half we were much more patient and stuck to the task of breaking the opposition down. “We then started making opportunities and getting crosses into the box. “The key was to get crosses into the box and we started to do that. With Celtic, Rangers and Aberdeen all in with a chance of progressing from their respective games, Boyle is well aware Scottish football could be given a timely shot in the arm this week. “As long as we put in a good performance, we’re always confident,” said Boyle. “Last week was a good week for Scottish clubs in Europe; Rangers, Celtic and Aberdeen all did well and if we can all qualify this week it will be good for the country. “Reaching the group stage is the main aim – we believe it’s achievable, but we’re taking the ties game by game. Boyle played as a striker alongside Kamberi against Tripolis at Easter Road and as Lennon continues his search for more firepower, the Aberdonian insists he would be happy to help out again. He added: “I have played as a striker before – when I was at Montrose I mostly played up front – but it’s a bit different when you are playing down the leagues. “It’s a more physical challenge at this level and I’m trying to work on different aspects of my game.